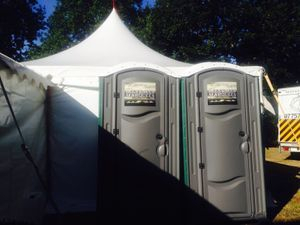 Our deluxe toilets are always of a high standard, they are clean and fresh smelling and stocked ready for immediate use. Our toilets do not require power or sewer connection they are totally self contained. Toilets cannot be lifted, carried or craned into back gardens, usually toilets are placed on drive ways or sideways if access allows. Our reason for this is full toilets are very heavy and could cause injury to us or you when trying to get them out, also the waste would spill out if the toilet was to be carried. If you have van access to your back garden then the toilets can be driven in and positioned.